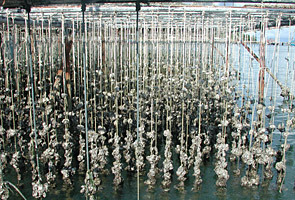 Oysters in aquaculture in Thailand. The science of farming organisms that live in water, such as fish, shellfish, and algae dates from the 8th century in Japan. In 2003, the value of U.S. major commercial bivalve species (especially the Soft-Shelled Clam, Hard-Shelled Clam, Surfclam, Geoduck, Blue Mussel, Eastern Oyster, and Sea Scallop) exceeded 570 million U.S. dollars. Economically, the most important bivalves under aquaculture are Blue Mussels, with peak production of 500,000 annual metric tons in the late 1990s. 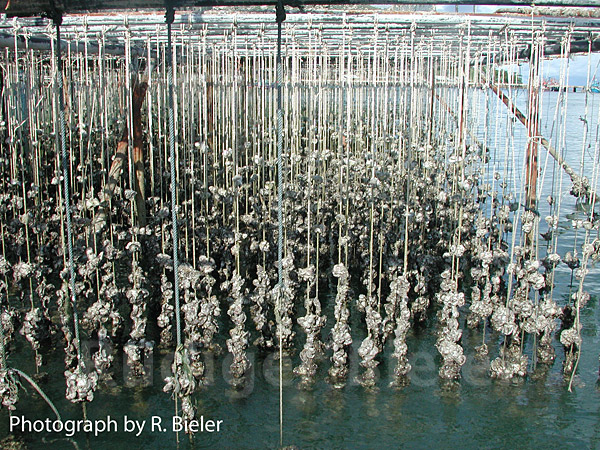 The worldwide marine bivalve harvest (that is, the collection of wild populations, as opposed to those raised in aquaculture) in 2002 was more than 2 million metric tons. 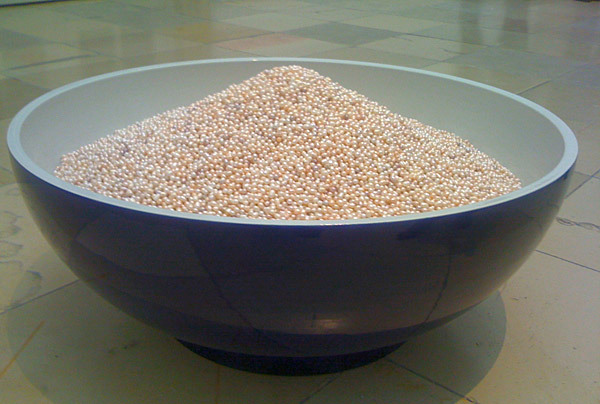 Pearl production is an important industry, especially in Japan, China, Australia, French Polynesia, and Indonesia. Shells of freshwater pearl mussels, formerly important in the button industry, are now used to produce beads that are implanted into marine pearl oysters to initiate cultured pearl production. 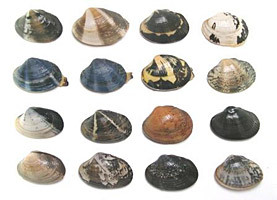 The shells of many bivalves are also commercially valuable as ornamental objects, jewelry, collectors’ items, and as mother-of-pearl for inlay. "Bowl of Pearls" by Chinese artist Ai Weiwei, ca. 1.3 m in diameter. 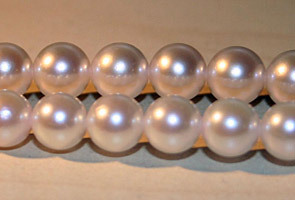 Japanese Akoya pearls, each 6.5-7.0 mm in diameter. 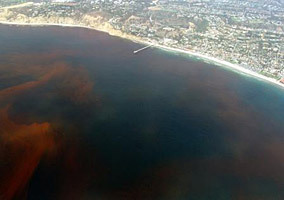 Red tide near La Jolla, California. Because they feed by filtering water, bivalves accumulate heavy metals, bacteria, viruses, and toxins that are in the water in which they live. With the expansion of aquaculture and subsequent increase in shellfish consumption, the risk of bivalve-derived diseases, more generally known as “shellfish poisoning,” is an increasing concern for public health management. Chiefly marine, planktonic, usually solitary phytoflagellates (which have many characteristics in common with algae) that include luminescent forms, forms important in marine food webs, and forms causing red tides. occasionally bloom in the oceans. 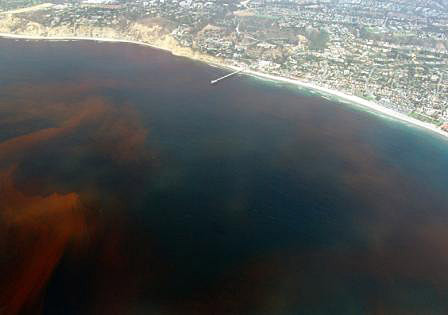 Such an outbreak is called a "red tide," because the toxic waste products of the dinoflagellates can turn the water orange or red. 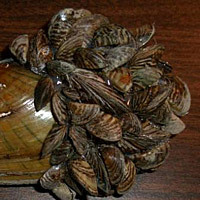 During the course of normal feeding, bivalves concentrate these toxins, and if they are later eaten by humans, dangerous and sometimes deadly shellfish poisoning can occur. 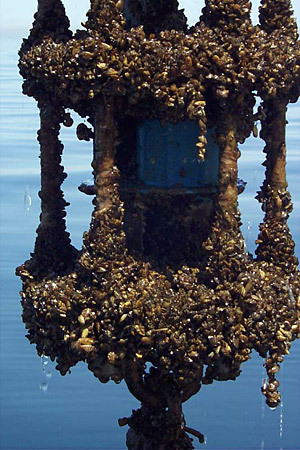 Local departments of health in areas near the shore constantly monitor the toxin levels in the ocean and periodically close areas to shellfish harvesting if the toxins reach a dangerous level. More information on shellfish poisoning can be found here. Some marine and freshwater bivalves pose important economic threats. 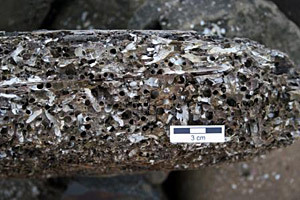 Native shipworms and other boring bivalves (Teredinidae, Pholadidae) can bore into untreated wood and damage marine constructions, such as piers and boat docks. Community of organisms found attached to hard substrata, most usually human-made, e.g., on the sides of docks, marinas, harbors, or vessels. and can have a tremendous negative impact on fuel efficiency. A tuft of long, tough filaments which are formed in a groove of the foot, and issue from between the valves of certain bivalve mollusks, by which they attach themselves to rocks, etc., with estimated costs of removal and equipment repair from 1989-1995 of US$69 million. This is also a serious problem at nuclear power stations in Europe. Date Mussels and a few other bivalve species can bore into soft limestone and coral, acting as both positive and negative agents in bioerosion. Bioerosion in a wharf piling caused by boring bivalves. 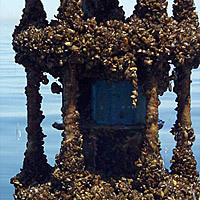 Zebra Mussel-encrusted current meter in Lake Michigan near Michigan City, Indiana, June 1999. The vast majority of negative ecological impacts by bivalves are caused by invasive species, spread either accidentally or intentionally. Some of the best-documented marine invasions are the Manila Clam in the Mediterranean and North Atlantic, and the Pacific Oyster in parts of the Indo-Pacific, both of which have caused serious ecosystem imbalances. Occurring at the bottom of a body of water, for example, a seabed, riverbed, or lake bottom. invertebrates for living space and food resources. They also attach to native freshwater pearl mussels, many of which are already threatened or endangered species, smothering them and/or preventing their valves from opening and closing properly. The Manila Clam, Venerupis philippinarum. 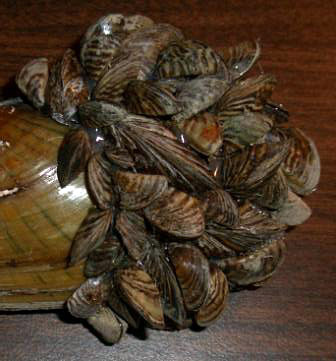 Zebra Mussels attached to an American freshwater mussel.